Sometimes I think I have the best job! 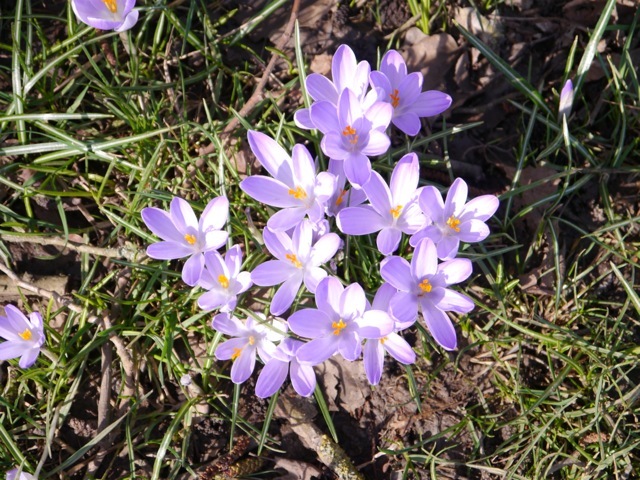 The weather forecast this weekend is warm sunshine…I’m going to try and get out in my own garden and make a start on spring pruning, tidying up and mulching the beds. 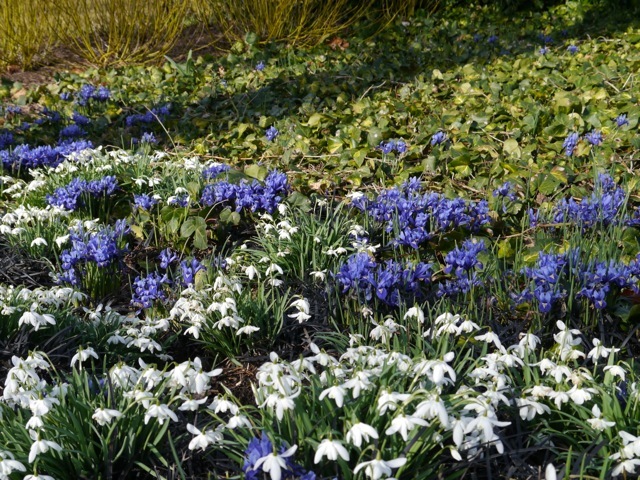 Snowdrops and early Irises are also a stunning combination – here they are poking though a ground cover of ivy. Iris reticulata like sunny well drained soil – under deciduous shrubs is ideal or coming through a carpet of creeping thyme. 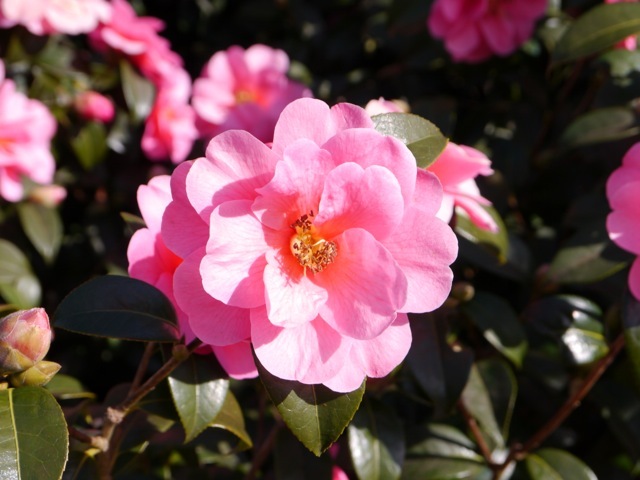 Perhaps you have a shady corner where you can plant a Camellia – we are lucky to have acid sandy soil in Ascot and surroundings so these shrubs thrive and flower early – Camellia Donation below is one of the earliest. 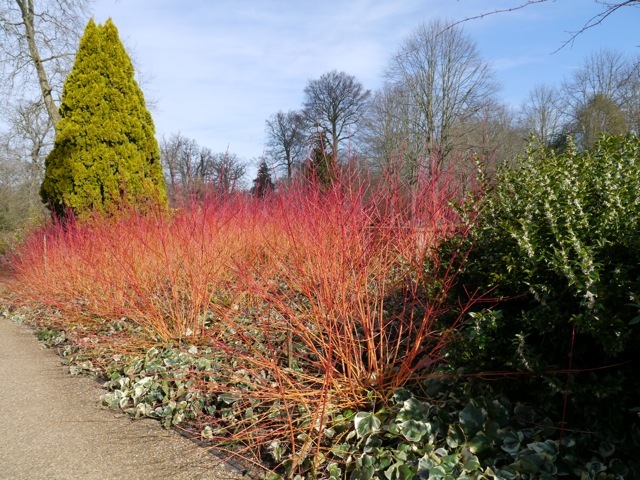 Cornus stems are stunning in the early sunshine – these I spotted at Savill garden. Cornus sanguinea Anny’s winter orange is a newish variety, brighter than C. Midwinter fire. I cut mine down to the ground as soon as the tips start to sprout and use them as Easter decoration in the house. 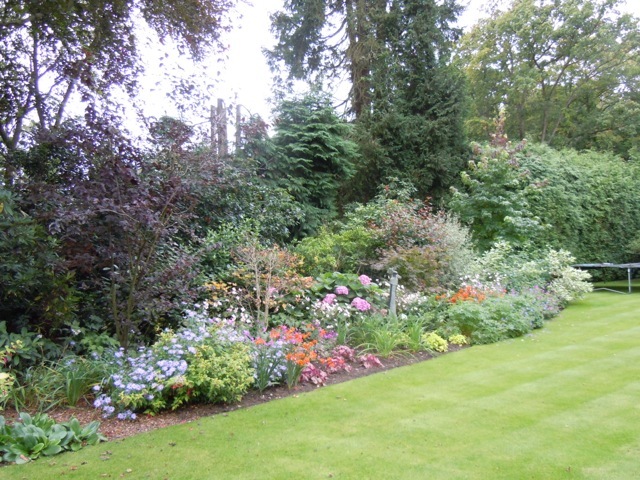 At Savill Garden this morning all the roses have been pruned and all the perennial borders mulched with a thick layer of compost – it’s time to get going! 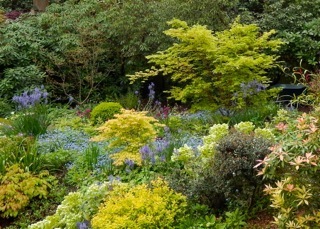 If your garden looks overwhelming and you don’t know quite where to start – invite me round to see what I can suggest. 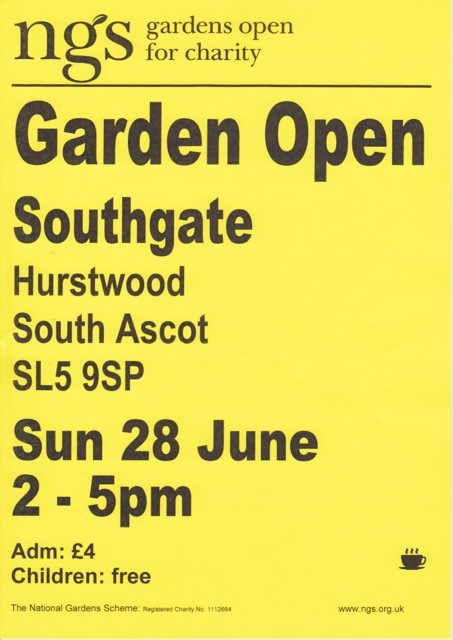 My first visit is without obligation and I can give you a proposal for a whole garden redesign or just replanting the border you can see from the kitchen window. 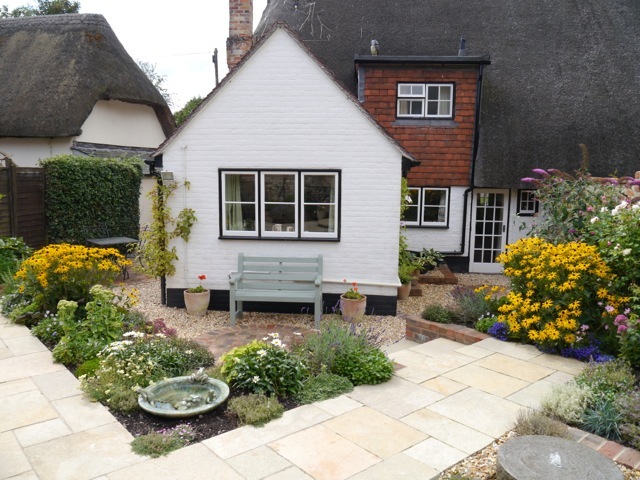 Here’s a project in a difficult shaded border I replanted for a client to give a view of bright colour from the kitchen window – she loved it! 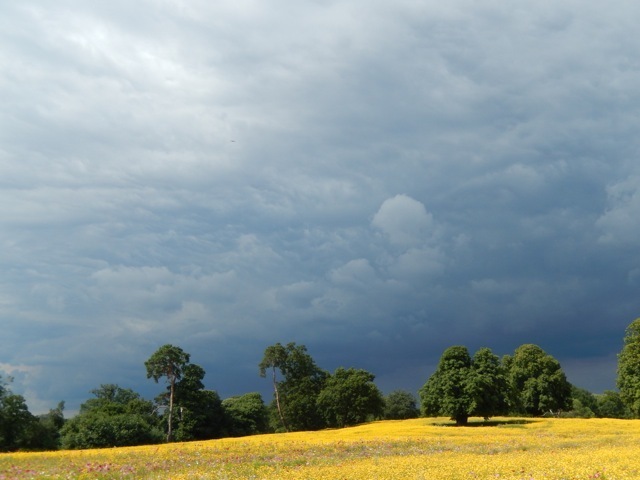 The meadow is beautiful! I would love to have one but you do need open ground and plenty of sunshine which I do not have at home. 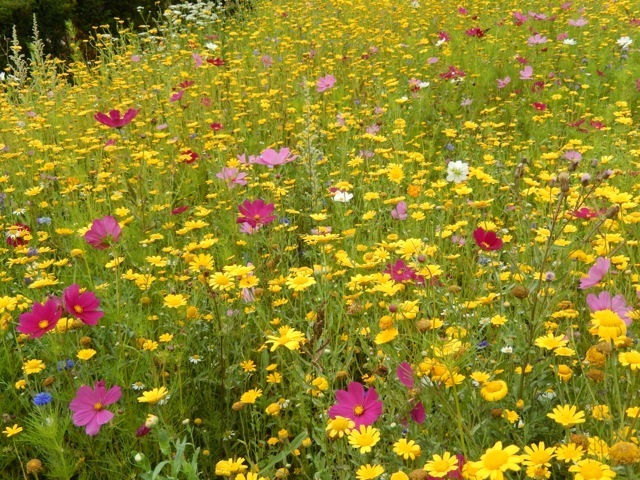 This meadow is seeded every year with a French mix containing pink Cosmos but the yellow corn marigold is dominant. There are blue cornflowers and white corn chamomile but they are shorter so can’t be seen until up close. 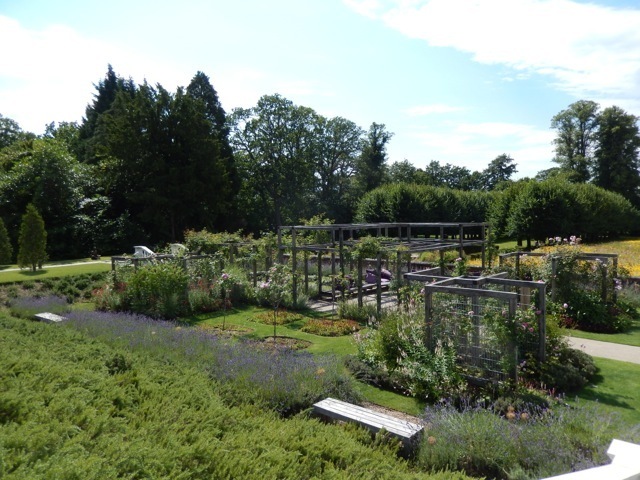 The rose garden has a contemporary look with the roses growing in ‘cages’ and over a beautiful green oak structure surrounded by lavender and creeping rosemary – the cushions on the benches are colour coordinated mauves and purples. 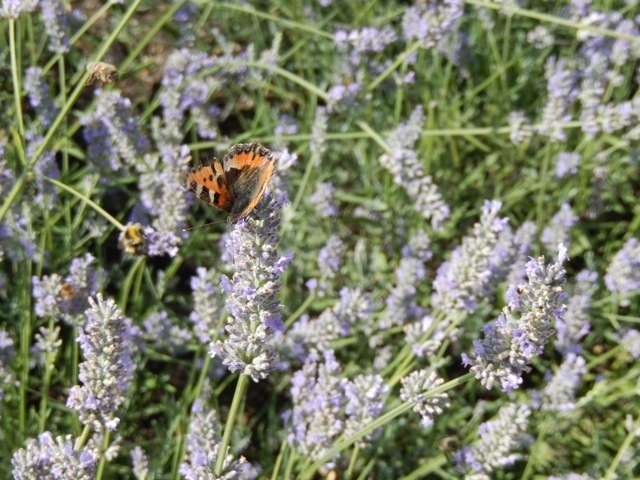 The meadow and lavender banks were full of insect life – they must love the planting! 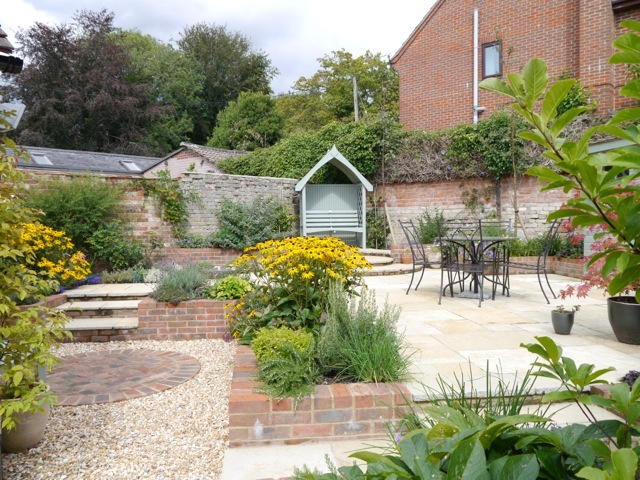 The lower terrace provides a calm contemplative space to sit surrounded by pink and purple planting. 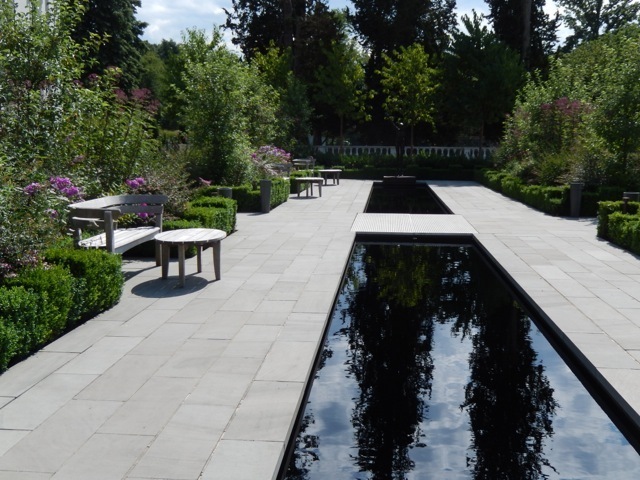 The pool is dyed black to give additional contrast to the pale stone and provide a more reflective surface to watch the clouds! What a delightful series of spaces! 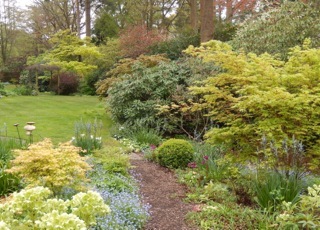 Its a grey day today but the acid green of the new spring foliage and the blue Camassias brighten the woodland. 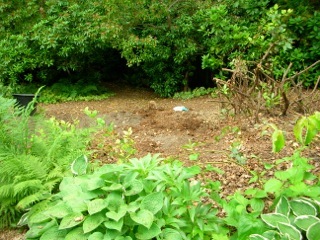 This patch of ground was cleared of Rhododendron ponticum and roots in summer 2010 and the ground substantially improved with bags of compost and leaf mould dug in. It sits beneath mature oak trees and is very shady and dry, but with work on the soil and careful watering in the first year it is now established and left to itself. 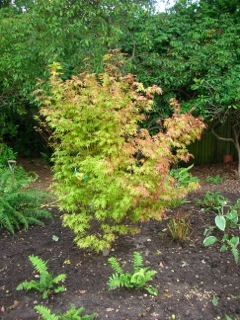 I planted the Acer Corallinum for Tony’s 60th and surrounded it with ferns and hostas split and moved from around the garden. 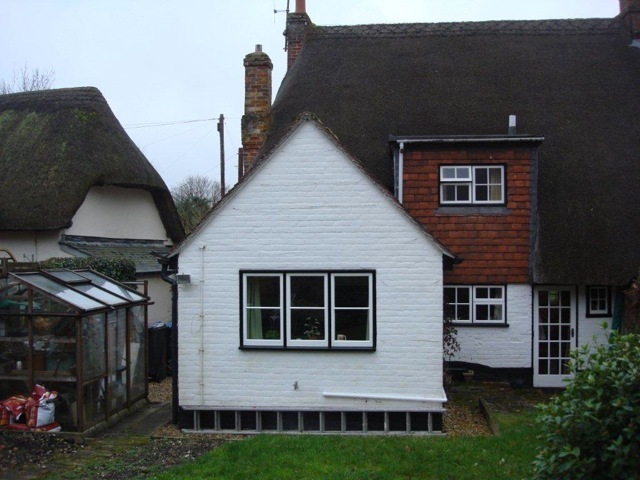 It is of course predominantly a garden for spring colour but I can see it from my kitchen window so it gives me pleasure even on these rainy days. 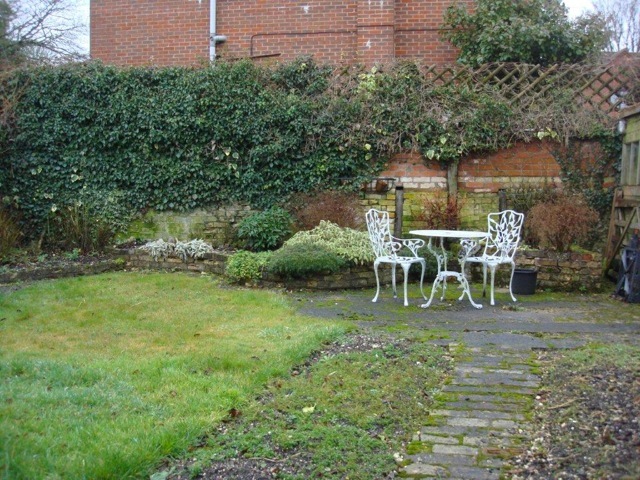 There is a wood chip pathway running through to the back garden and several other routes (shortcuts for the dog and wheelbarrow) for access. Highlights this week are the mauve/blue spires of Camassia leichtlinii and the foamy mass of forget-me-nots along the route. 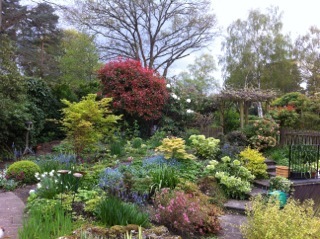 I think the contrast with the acid green foliage and Helleborus corsicus flowers is a delight! Looking back the other way you can see the dark red foliage of Photinia red robin, a plant I have mixed feelings about. In shade it can get very open and has the annoying habit of dropping the old leaves as the new leaves come in like many evergreens. You can just see the white daffodils Narcissus White Wings coming to an end as the Camassia come into their own – and next year I am going to add some tulips to extend the colour. I was inspired by my visit to West Green House in Harley Witney this week – the tulips there are fantastic – I urge you to go! Marylin Abbott at West Green uses a ‘colour wheel’ scheme for her tulip planting which is a stunning success. 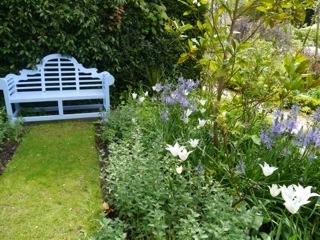 In her ‘blue’ area she uses just blues, white and acid greens and paints the bench to match – looks great doesn’t it? Even the bench matches the scheme! 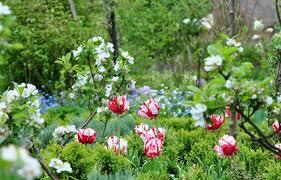 I think I will copy her and plant white tulips in my woodland – but maybe give the bench a miss!